Thankfully the members of the MLBPAA noticed this close comparison and named Semien the winner of the award for the Oakland Athletics. Of course there is a bigger, overall award that is voted on by former MLB players. It is the only award of its kind as only former players may vote for the winner. The MLB winner will be announced on Nov. 15, 2016 at the 17th annual Legends for Youth Dinner in New York. The award is only about a decade old and the past overall winners include David Eckstein (2005), Craig Biggio (2006, 2007), Grady Sizemore (2008), Albert Pujols(2009), Roy Halladay (2010), Torii Hunter (2011), Mike Trout (2012), Dustin Pedroia (2013), Josh Harrison (2014) and Anthony Rizzo (2015). It would be great to see Semien as the overall winner. As I highlighted above the award is mainly based on “passion, desire and work ethic.” I do not believe there is a better candidate out there than Marcus Semien. To read more of this story on BBST – Click Here! Friday night Kendall Graveman put up his best start of the year, holding the Angels to just three hits while striking out four through seven innings. He worked efficiently, getting ahead in the count and threw just 91 pitches. It was by far his longest outing and best of the year. The 25-year-old right-hander is no stranger to inconsistency. In 2015, for example he was optioned back to Triple-A in early May and returned on May 23 to pitch in nine straight starts without allowing more than three runs. Then he suffered an injury and the A’s, who were in last place, shut him down for the rest of the season by August. This time it was the bullpen’s turn to have a tough game. Graveman left the game with the score 2-1. Closer Ryan Madson, who has yet to blow a save for Oakland, allowed a sac fly to Johnny Giavotella with runners on first and third with two outs. Bottom of the ninth and surprisingly the A’s rallied back. Jed Lowrie grounded out and Yonder Alonso flied out. With two outs Marcus Semien drew a walk from the Angels’ pitcher Fernando Salas and Jake Smolinski singled to right, moving Semien to third base. 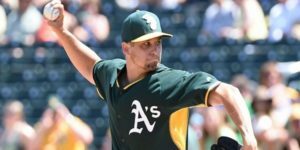 The Oakland A’s already completely depleted starting rotation may have lost another member Monday night. Sean Manaea left the game early. with forearm soreness. The seriousness of the injury is thus far unknown, however, the A’s medical staff has said that they believe the injury to Manaea’s forearm to be a strained pronator muscle and not necessarily ligament damage. However, the full diagnosis will not be known until the team gets the results of his MRI on Tuesday. 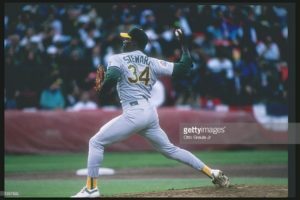 When most people hear the words “forearm soreness” their mind automatically jumps to a torn ulnar collateral ligament and Tommy John surgery. In the fifth inning of Monday’s 14-5 rout of the Texas Rangers, after having just given up a home run to Shin-Soo Choo, that’s where Manea’s mind went. This wasn’t the first time Manaea had felt the pain in his forearm. It had bothered him a bit at Triple-A Nashville earlier in the season but this was more intense. A’s manager Bob Melvin said that he and the rest of the coaching staff could tell that something was off with Manaea, as they were having trouble distinguishing between Manaea’s fastball and changeup. He throws a hard changeup so they continued to watch but after the home run to Choo, it was apparent to them that it was time for a visit to the mound.